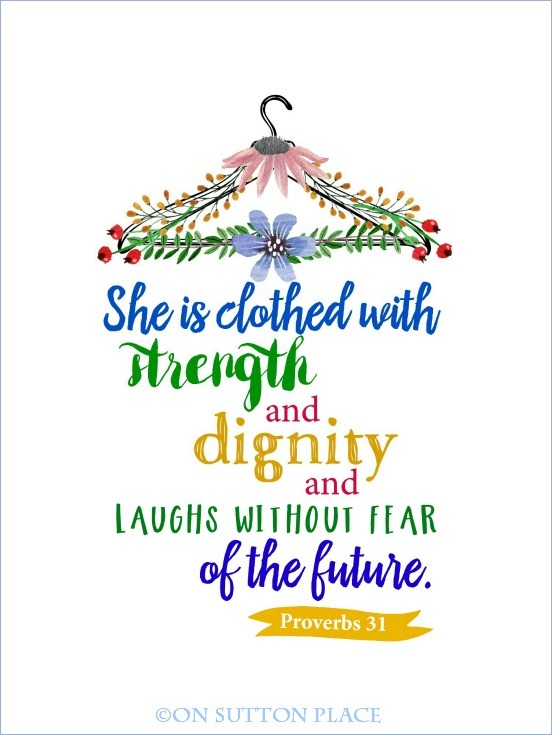 Up today is a printable of a very beloved bible verse that can serve as inspiration for any girl or woman, from any walk of life and from any place on earth. 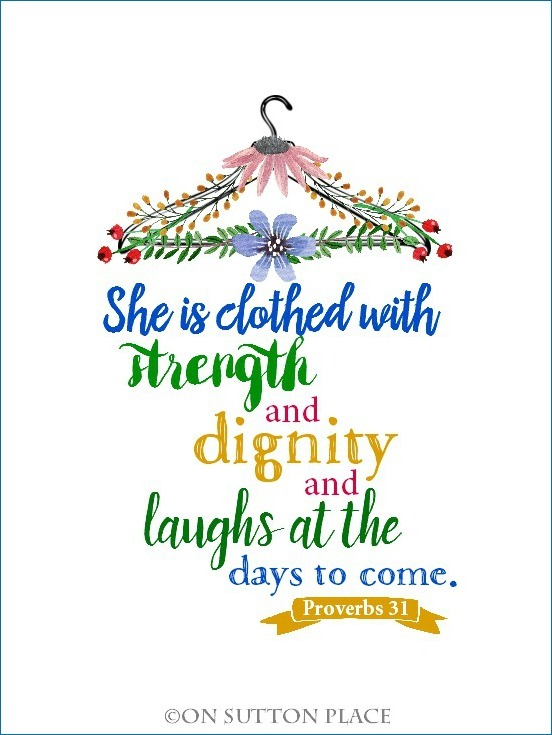 I am not a bible scholar by any stretch of the imagination, but this single verse sometimes gives me the “strength and dignity” to get through a bad day…or keep my chin up when I’m ready to crumble. 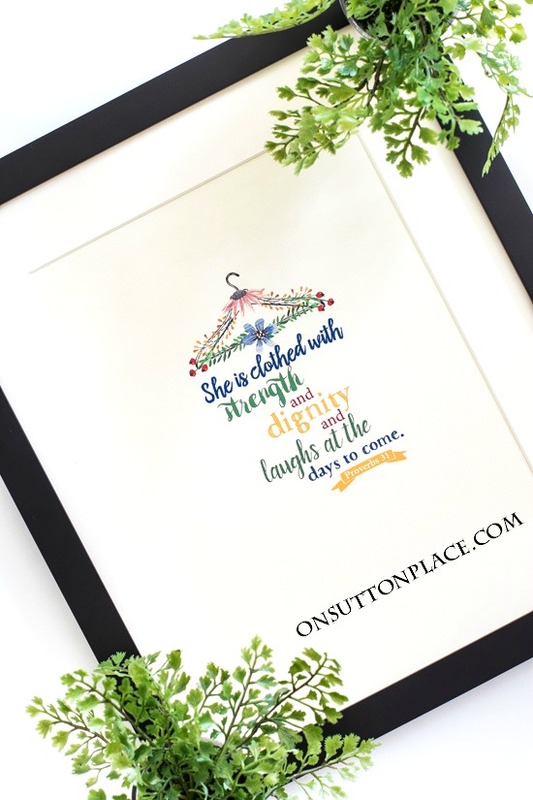 I am happy to be sharing these Proverbs 31 Free Original Printables with all of you. I’ve included two versions. The first one is the Catholic version found at this website. The second version is the more popular one…especially on Pinterest! Links to download both printables can be found at the end of the post. I’ve also included this watercolor floral bouquet just in case you want to pair it with the Proverbs one…or maybe use them both as part of a gallery wall. I’ve printed and framed them already…and I just love them. Here they are hanging in my entry. They are really the first pop of spring that I’ve added to the inside. I’m a little behind this year and will most likely just skip right to summer! These could definitely stay up all the way through to fall. 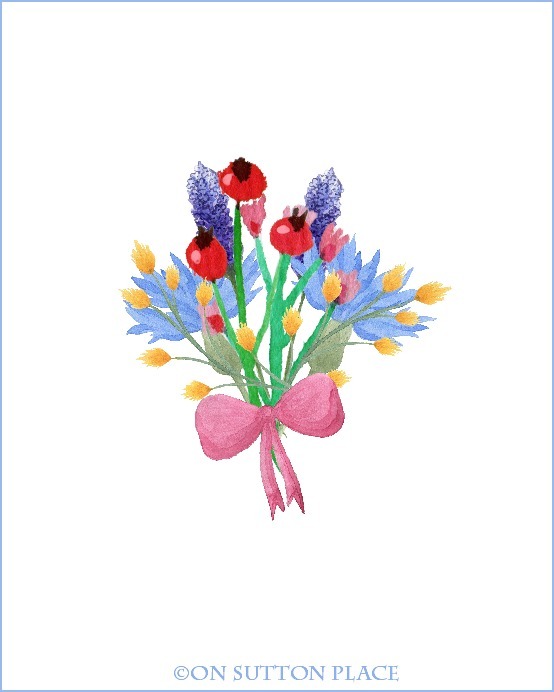 Click HERE to download Watercolor Floral Bouquet. Thank you for taking a look and for your friendship. This is beautiful! I love your floral alphabet too! Pinning! So glad you shared at Welcome Home Wednesdays! What a great verse and such a pretty printable, thanks. I’m pinning for now and I just never know when I might need this! 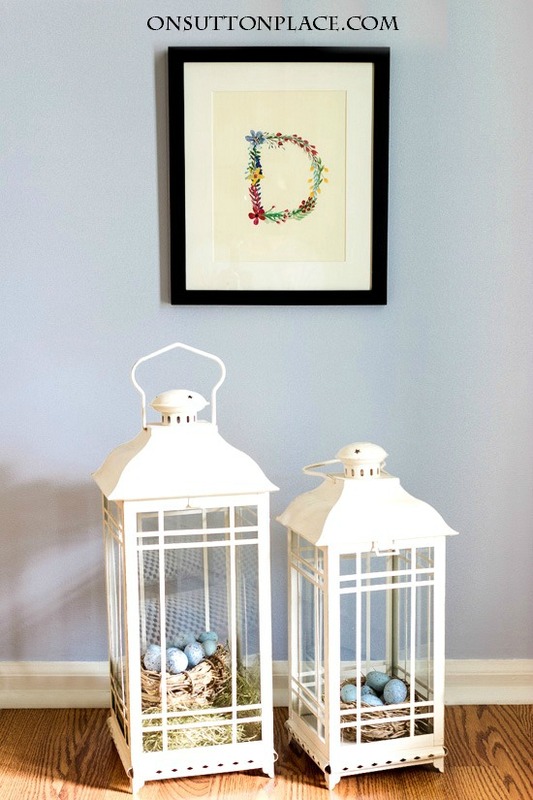 I absolutely LOVE these printables and I am so excited about the floral alphabet you are working on, Ann. Thank you so much! This printable is just lovely. I printed it and I slipped it into a magnet frame. We gave them to the Mother’s at church. They loved them! Thanks for your generosity. Thank you for the Proverb quote and illustration. I love quotes from the Bible and appreciate the printable. Your blog is very helpful, interesting and practical, and I appreciate your sharing your good ideas. Sometimes I need to be reminded to get on the happy side of the street, and your little picture should do the trick! Thank you for this encouraging print. Do I need to sign into Box to download it? Hi Peggy! You should not need to sign into Box to download. There’s a download button at the top of the page. Let me know if you have any trouble. Thank you Ann what a great reminder and inspirational printable this is . I’ll be printing and framing it to go along with my sis-in-laws birthday gift. I really enjoy your site and your talent . Thank you. Thanks so much Ann…I am printing this for a friend going to court in the am. Perfect! Thank you, Ann, for the lovely, much needed encouragement! Thanks for these & all your inspirations.Always look forward to your blog. This was perfect arriving today as my son’s flew in to be with me. I had to tell them that I’ve been recently diagnosed with stage 3 kidney disease and what I’ll be facing down the road. Sending up prayers for you and your family, Peggy. Keep your hand in God’s hand. Oh please, could you have the alphabet ready in time for Mother’s day? Very pretty! Thanks Ann these are pretty and a great verse. I think I will make one for my granddaughter,she’s just 7 but maybe it will help her. Thank you, Ann, for these lovely printables. Can’t wait to see the alphabet! The timing of this Proverb could not be better. We just did a celebration of life for my sister’s husband on Friday who passed away last Sunday from cancer. I will print this and frame it for her. Thank you! LOVE these! Looking forward to the letters, too. Thank you so much! Really enjoy your content and your printables! Thanks for sharing! This is new to me! Thank you. These are all beautiful. Thank you for sharing. I am looking forward to the alphabet. I think I will share them with both my daughters and granddaughters. Thank you for sharing with us. I love this verse. My mother’s funeral sermon was based on Proverbs 31, over ten years ago. Every time I hear the verse I think of my smart and talented momma. Thank you such a beautifully done printable. Looking forward to your alphabet! You are like a best friend Ann. I just love you and I thank you for always sharing. I plan on printing these for my sweet daughter in law and helping my grandson frame and give to her for Mother’s Day. You are a wonderful example to all of us. Thanks Ann. I love all of them!! Beautiful. I will frame and gift your first graphic for my sister’s birthday in May. I so appreciate your talents. Simply beautiful! Thank you, Ann!